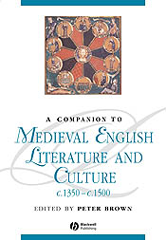 A Companion to Medieval English Literature and Culture, c.1350-c.1500 challenges readers to think beyond a narrowly defined canon and conventional disciplinary boundaries. A ground-breaking collection of newly-commissioned essays on medieval literature and culture. Encourages students to think beyond a narrowly defined canon and conventional disciplinary boundaries. Reflects the erosion of the traditional, rigid boundary between medieval and early modern literature. Stresses the importance of constructing contexts for reading literature.Explores the extent to which medieval literature is in dialogue with other cultural products, including the literature of other countries, manuscripts and religion.Includes close readings of frequently-studied texts, including texts by Chaucer, Langland, the Gawain poet, and Hoccleve. Confronts some of the controversies that exercise students of medieval literature, such as those connected with literary theory, love, and chivalry and war.